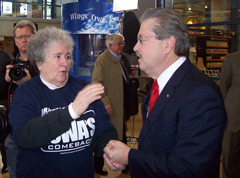 Terry Branstad talks with a supporter as he launches his campaign. Former Governor Terry Branstad used the word “comeback” more than a dozen times as he formally kicked off his fifth campaign for governor this morning in Des Moines. Branstad, a Republican, spoke for just over 10 minutes, briefly outlining his 16-year record as governor and promising that if he’s elected, he’d work to create 200,000 new jobs in Iowa. Branstad also said increasing “family incomes” by 25 percent and striving for “educational excellence” would be other priorities. “I truly believe Iowa is poised for an historic comeback and I believe it’s this campaign and you who will start this comeback,” Branstad said, to more cheers. 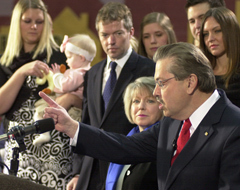 Terry Branstad announcing 2010 run. About 200 people gathered at the State Historical Building this morning for Branstad’s first stop in a 17-city “announcement” tour. Branstad faces a primary battle with three other Republican candidates who are vying for the chance to face-off against Democratic Governor Chet Culver in November. Click on the audio link below to hear Branstad’s speech. The chairman of the Iowa Democratic Party held a news conference an hour before Branstad’s announcement. Michael Kiernan said he wanted to “set the record straight” about Branstad’s 16-year tenure as governor. Kiernan accuses Branstad of “trying to have it both ways” when it comes to his record on taxes and spending. Kiernan plans to travel to 13 of the same cities Branstad will visit on his tour this week, holding news conferences in each places in advance of Branstad’s appearances. Click on the audio link below to listen to Kiernan’s news conference. The opening music for Branstad’s kick-off event was “Jump” by Van Halen, a song released in 1984 during Branstad’s first term as governor. Branstad told the crowd he considers getting Iowa’s fiscal house in order to be “job number one” if he’s elected in 2010. Branstad also said he’d work to cut the size of state government by “at least” 15 percent. Branstad’s former lieutenant governor running mate Joy Corning and Doug Gross, Branstad’s chief of staff who was the 2002 Republican nominee for governor, were on hand for this morning’s event.